A 97-year-old woman was critically injured in a hit and run crash Thanksgiving evening and Aurora police are asking for the public’s help in finding their suspect. According to Aurora Police Department spokesman Dan Ferrelli, the head-on crash occurred around 7:55 p.m. on Nov. 24 at the intersection of Asbury Drive and Saratoga Drive in Aurora. 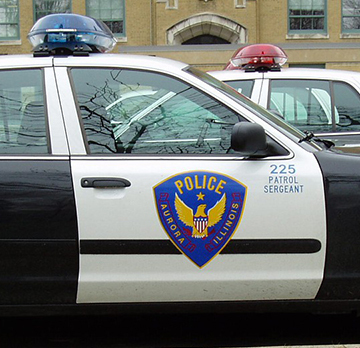 A 48-year-old Wheaton man was driving a 2007 Chevrolet Cobalt with a 97-year-old Aurora woman in the front passenger seat and a 73-year-old Chicago woman seated in the back, Ferrelli said. As the Cobalt turned southbound onto Asbury Drive from Saratoga Drive, a pick-up truck, described as possibly white in color, veered into the same lane as the Cobalt and struck the vehicle head-on. Police said the impact of the crash sent the Cobalt backwards where it struck a parked and unoccupied 2009 Honda Accord, then came to a rest. By the time police arrived, the driver of the offending vehicle had fled the scene, leaving the Cobalt’s now injured passengers behind, Ferrelli said. The 97-year-old woman seated in the front passenger seat suffered numerous broken bones and was airlifted to a suburban Chicago hospital in critical condition after initial treatment in Aurora. The Cobalt’s driver and the 73-year-old woman seated in the backseat were both treated at Rush-Copley for non-life threatening injuries. Aside from the vague description of the suspect’s vehicle, police have no other information about the driver of the vehicle or anyone else who may have been inside of it, Ferrelli said. Anyone with information is asked to call Aurora Police Traffic Investigators at (630) 256-5330 or Aurora Area Crime Stoppers at (630) 892-1000. Callers to Crime Stoppers are anonymous and qualify for a cash reward of up to $5,000 for information that leads to any arrests. Tips can also be submitted through the Aurora Police Department’s free app available from iTunes, the Android Market, or Amazon App Store. Simply search for “My Police Department”, find the Aurora Police, and download.